Tea Rose Home: Link Love No.11! I love visiting your blog and seeing what you have been creating. There are so many reasons why we create. For our home, family, friends, and just simply the love of doing it. When I am designing and working with my fabrics, I feel happy, I am thinking about who I'm making this for, and I feel I am being myself. When I am visiting your blog, I feel that you are the same way. It is so nice to know that there are many other people out there who enjoy creating. I firmly believe that being creative makes us and others happy. I found some cute things and some new talent that I can't wait to share with you... take a look at them! I see spray paint bottles everywhere, it this a new trend? Someday Craft shared cute examples of her version with us. I almost died when I saw these cute reversible pants for boys by The Train to Crazy.com. Aren't they darling? Not to mention very useful? My boys had reversable pants from gymboree when they were babies, but I love her's much better! No Big Dill is new to this link party, but I can see her talent! 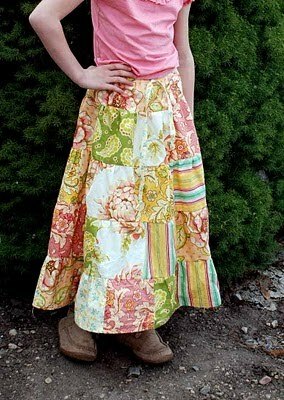 She shared the dress her little girl designed and she sewed. The dress is stunning. I love the leggings she is wearing too! Welcome to the Good Life shares how to modestify your summer dress. Being LDS myself, I tried the same thing before. Her step by step tutorial she shares with us makes it look so easy and simple. 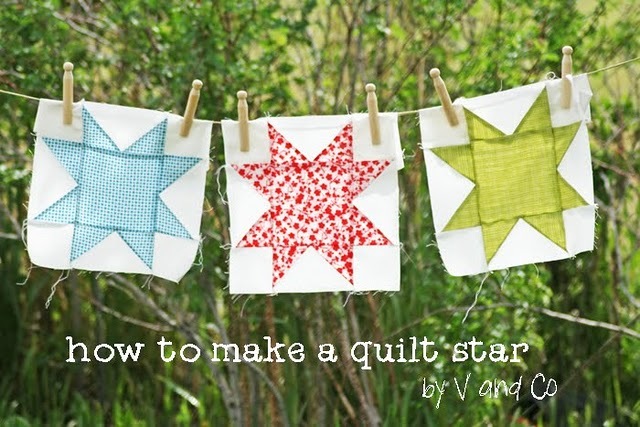 The last project How to make Quilt Stars was linked by The Vanessa from V & Co!. Check out her step by step tutorial, and get inspired. Thank you for joining our party Vanessa! Thank you for linking everyone. I will see you at my next post! I like what you are doing with the link party, keep it on! Btw, thanks for changing your settings, so that your posts appear in Google Reader in their entirety - it's much handier and helps not to miss a post. aww thank you for featuring mine! I didn't know you were LDS. :) now we have two things in common, being LDS and being Asian! :) I love all your amazing work! Your link party it´s great!! so many talented people together!! I really enjoy it!! Also totally agree with your comments about how we feel when creating!! I´d like to do it everyday, every hour and not just "when possible"... hopefully one day this will be the other way around!!! thanks for the inspiration!! Link Party No.10 /My Little Project " Bleached!"